Spring Clean up time? Not so fast! The snow is receding finally! Did you know that Bangor is within the top 3 cities & towns in the country to receive the largest amount of snowfall this last winter?!! After what we just went through, I’m sure all of you are feeling the fever to get outside and get this season started! The past few days have certainly been a wake up call. Spring cleanup is important but some precautions should be taken before you run right out with your rake in hand as it relates to turfgrass. Please remember that the aim of your spring cleanup is a positive thing and that should be your focus. Make sure you are not doing more damage than good. Soil moisture should be your focus with cleanup activities. When the soil is moist you can cause more damage than good. Driving a tractor over wet soil is the sure way to compact soil and make the start up that much more difficult for your grass plants. Our suggestion is to wait until the grass is Dry and the soil has had a good opportunity to dry a bit before diving right in to your cleanup. Roots in the winter can die back due to several factors. If you rake or use power brooms too soon when grass wet you can easily pull plants directly out of the soil if the roots have shrunk. Deep frost this winter due to historic temperatures will prolong cleanup and can also “sheer” roots from their shoots. Grass plants will have to regenerate root systems prolonging spring recovery. In addition to the rough weather conditions, the snow pack is of another concern. 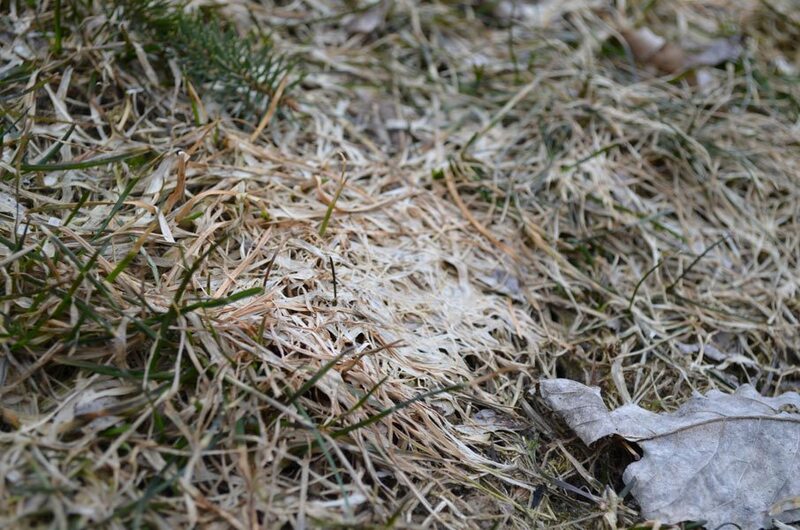 Many lawns will be affected with snow mold. This is a fungus that is actively growing right now as the snow pack melts back. It will be important for you to rake out these areas of your lawn to allow the surface of the soil to see sunlight. If these areas that are affected do not get taken care of you can bet you will experience thinning turf from the snow mold alone. It is very important to ensure that the immediate surface of the ground/grass dries before raking. The key takeaway is that getting out too early when sites are too wet or frozen can do more damage than good. It may be frustrating to wait but patience is important. Attached within this post are some examples of snow mould remediation and what to look for. Light raking ONLY AFTER things are dry enough to do so! You goal is to break the caked surface that you see so that sunlight can get through and hope it’s not too late for those areas to recover from the fungi. One final note. Once your grass plants are tall enough to mow you should do so. How tall? 2.5 – 3 inches is recommended turf height. The taller your mow, the deeper the roots will grow. That directly relates to healthier plants, better natural weed control. Not to mention your lawn will look fuller. BUT… Before you begin your mowing this spring, please ensure you sharpen your mower blades if you have not done so yet! The cleaner the cut the less chance of fungus invading your lawn during the rainy months. very informative , keep them coming …….. This is so good to know – I was outside working (not on the lawns) and noticed white patches on the lawn and now I know what it is! Thanks! Can I use a Power Broom instead of physically raking my lawn this spring?? You certainly can! Just wait until the grass blades dry off a bit. This is exactly the info I needed!